It is interesting to read the viewpoint of OPEC each month, as it relates to global oil supply, and the numbers that they rely on to estimate how much production that will be required. 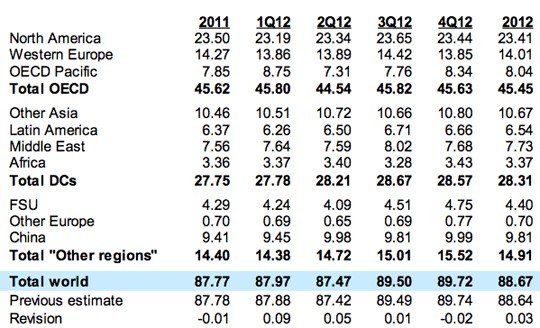 For 2012, for example, they now see no need to increase production above 30 mbd, (though it averaged 31.62 mbd in April, when NGL and non-conventional sources are included) with adequate production growth to meet demand (some 0.6 mbd) coming from non-OPEC sources that are anticipated to average 53 mbd this year. At present supply is seen as exceeding demand, hence there has been an increase in global stocks which OPEC has noted. However, while there appears to be relative stability in the market, this conceals the changes in internal consumption within the Middle East, that collectively effectively reduce the quantity of fuel that is available to the rest of the world, if their production overall remains flat. When sources for supply are examined, OPEC sees that the majority of the increase in supply will come from increases in North America. 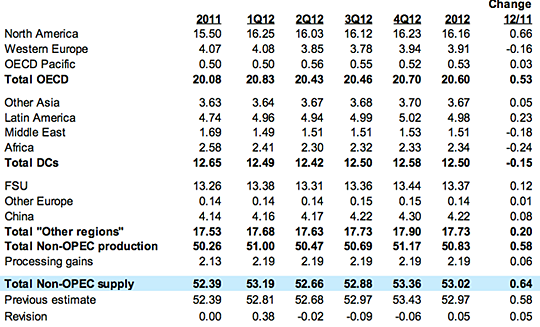 A further increase in production of some 0.66 mbd is anticipated over the production in 2011. Figure 5. 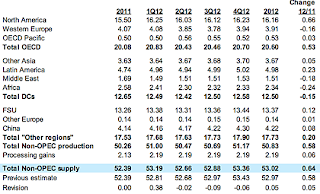 OPEC production through April 2012 (OPEC MOMR) Information from secondary sources. Of course, the increasing impact of sanctions on Iran, which is reported to have already cut exports from 2.2 mbd down to 1.7 mbd, contributes to the current drop in Iranian production. Whether those sanctions will toughen or lead to a resolution of the crisis is still one of those hanging questions . . . . Interestingly OPEC puts up two versions of the table shown in Figure 5, that above, which comes from secondary sources, and a second version that is generated from direct communication. The numbers for Iran and Iraq are notably different. Figure 6. 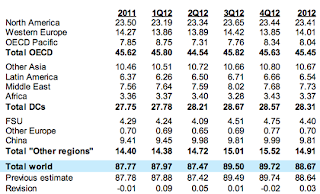 OPEC production through April 2012 (OPEC MOMR) Information from direct communication. Tehran, which provided the information for the latter table, is also now citing it in their press together with claims that they will be able to increase production by 1.5 mbd by 2016. Hmm! Well we will look at Iranian production after finishing the review of Saudi Arabia. Looking at all liquids, OPEC sees the world supply holding relatively steady, while OPEC has been steadily increasing production, a slightly different message from that of the summary at the top of the document. The impact of the oil sanctions on Iran can be expected to bite with increasing strength over the next two months, and it will be interesting to see how the market responds. There is evidence, cited earlier, that there has been some pre-positioning of additional supplies around the globe to help with offsetting the loss of the Iranian oil, and with the potential to release national reserves to alleviate problems. These are interesting numbers to watch, and so I will continue to monitor them in the months ahead. The decline in overall demand for OPEC oil, which the report sees can be anticipated to be due, in large measure to the increase in production from North America. How accurate that prediction will be over the year is an interesting topic for study. it is very nice to know that kind of topic.... it interest me a lot to read... thanks for sharing it to us..